Home > Travelling Essentials > What is a Gap Year? Proper preparation can make all the difference between a gap year that is smooth sailing and a gap year that flounders due to choppy seas. The task of preparing for a gap year may seem monumental, but with the help of these manageable checklists you'll be able to leave home stress free and certain you've done all you can to prepare for a fantastic gap year! Researching the kind of gap year that interests you, and reconciling it with the kind of gap year that you can afford, is the first step to a successful gap year. Budgeting is something any gapper will have to do in order to afford their ideal gap year trip. When preparing a budget include; air and ground travel, clothes and equipment, food, accommodation, placement costs and travel and medical insurance. As well as planning your budget you should start to plan your trip - investigate gap year placements in which you might be interested and research countries and regions you would like to visit. Don't forget to look up current travel advisories from the Foreign & Commonwealth Office. It is always a good idea to ask former gappers for their recommendations on placements and travel itineraries and invest in guidebooks for your chosen destinations to get a feel for must see attractions. Arranging for any needed holiday or work visas for the countries you hope to visit. Contacting travel agencies to inquire about flights and travel insurance. Creating a travel itinerary to leave with family/friends and to register at Embassies and High Commissions. Inquiring about travel vaccinations and certificates from your GP or local travel clinic. Obtaining travel and medical insurance claims forms. Filling needed prescriptions and obtaining an extra pair of glasses. Notify your bank and credit card companies of your travel plans. Contact colleges or universities about deferring degree places as needed. Freeze your gym/library/video shop memberships. Purchase traveller's cheques and obtain foreign currency. Finally, when there's nothing left to separate you from the gap year of your dreams but one quick or long, flight, get down to the business of having fun! Don't leave home without asking friends and family for their souvenir requests, investing in a decent digital camera, iPod/mp3 or pair of sunglasses and consider it a necessity, setting up a website or 'blog dedicated to your travels and finally throw yourself a wild going away party to kick-start your gap year fun! 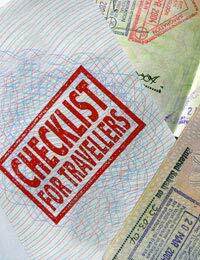 Checklists are a simple way to make sure that you cover all of your bases before embarking on your gap year abroad. If you have booked your trip via an agency, ask if it has any checklists to help you with your specific placement preparations and packing requirements. Don't be afraid to tailor these checklists to your specific needs, adding or deleting items as desired, and don't be afraid to share these helpful hints with friends! Good luck!